It has now been over a decade since Chris Ware’s Jimmy Corrigan – The Smartest Kid on Earth was published in collected form, and almost two since he first drew the character in a number of short strips in the Chicago weekly New City. Through the nineties, as it was being republished for the first time in his ongoing serial the ACME Novelty Library, it was for many consistently the most anticipated serialized comic around; an indication that comics were experiencing an artistic renaissance and a harbinger of great things to come for the medium. Its release in book form in 2000 has now come to be seen as an emblematic event in what certain commentators, such as yours truly, have termed the international “new wave” of comics, which has since only gained in force and momentum. 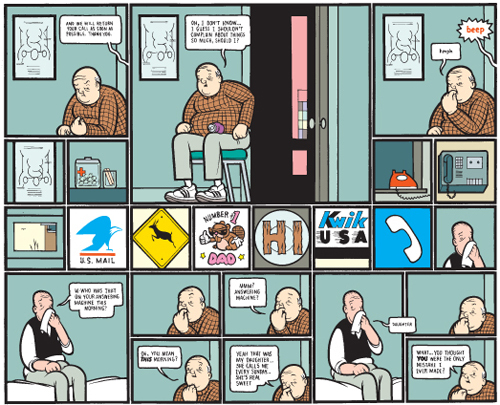 And Chris Ware is still working somewhere at is center, simultaneously expanding and refining his approach to comics, most recently with ACME #20, or “Lint”, which provides as good a touchstone as any to chart his development since Jimmy Corrigan. 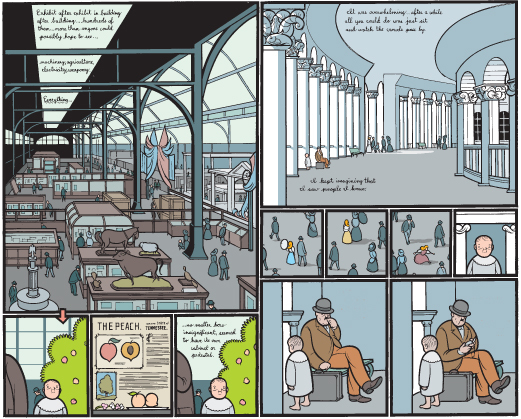 The following is a re-examination of Ware’s seminal book, made with the benefit of a decade plus of hindsight, with attention paid to how it has contributed to the evolution of the art form of comics and how we think about them. 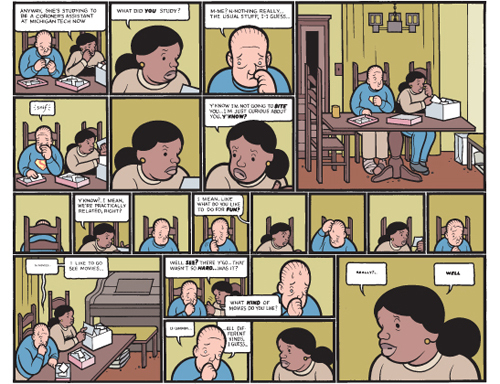 “Lint”, a chapter in Ware’s ongoing story Rusty Brown, focuses on the character Jordan/Jason Lint, attempting to capture an entire life through sixty-odd key moments, generally presented at annual intervals, either as experienced or remembered — probably both, the distinction is blurred — by Lint himself. Ambitiously, and tellingly for Ware’s way of working, it seeks initially to portray the forming of a young consciousness by stylistic means. Drawing in part upon one of his long-standing sources of inspiration, the work of cartoonist and children’s book illustrator Richard McGuire, the early pages of the book, which describe Lint’s childhood years, are rendered in a tidy, angular line. Ware gradually loosens it up and has it morph into more pliable, comprehensive form, while Lint’s language is forming in the dialogue as well as the initial bursts of pictographic stream-of-consciousness that continue to flare through the narrative as a whole. It is tempting to see this as an analogy to Ware’s development of a comics vocabulary, as initially and most persuasively synthesized in Jimmy Corrigan. 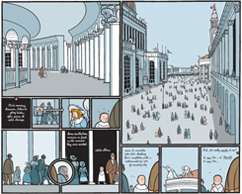 Previous to that book, he had been essaying a number of rendering styles and narrative techniques without settling on a consistent approach, whereas in Jimmy Corrigan he formulated a more stringent comics language. By working, as he continues to do, with a strong awareness of his tradition, by reconfiguring the inventions of others to suit his needs, he ended up proposing a reconciliation between lived experience and the symbolic language of comics. 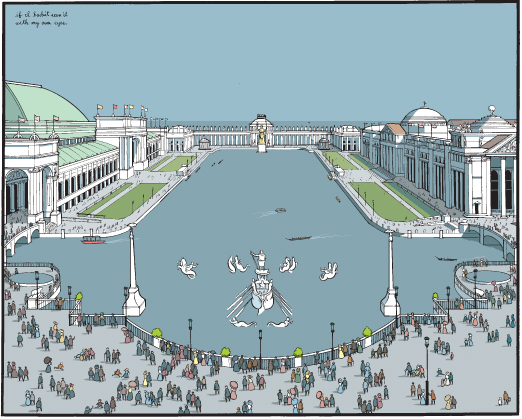 He would be the first to admit that it is debatable how well he succeeded — at least in public — but it is in this proposal, I venture, more than anything else that the artistic significance of Jimmy Corrigan should be sought. Ware is, as he himself has said, “trying to tell a serious story using the tools of jokes”, but finds in those tools a propitious resource for the merging of epistemology and symbology — of simultaneously representing experience and metaphor. Though far from the first artist to do this, in comics or beyond, Jimmy Corrigan functions as kind of an emphatic statement on the merits of such exploration of the comics form, as well as a map to guide future travelers, as indeed it has for almost two decades now. The first third or so of the book is clearly the weakest. It introduces Jimmy and takes him through his lonely paces at work, setting up his defining disconnect from people by way in part of the striking but ultimately excessive obfuscation of other characters’ faces — a device Ware thankfully tones down in the second half of the book. In these early pages, Ware employs a number of visual/narrative conceits — ornamental and stage-like page borders, heavy-handed dream sequences and symbology (the protagonist as a robot), etc. — that are later dropped in favor of more streamlined storytelling. Not unlike Alan Moore in the first two chapters of the equally seminal and thematically related Watchmen (1986-87), it is clear that Ware was feeling his way toward the story he wanted to tell, only gradually realizing its scope. He did however introduce several important themes and elements. 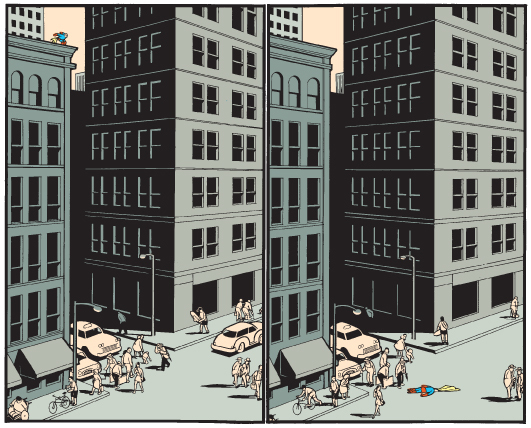 Most significant is the central motif of the superhero as father figure, as well as the building from which Jimmy imagines him leaping, situated on the Chicago street corner that anchors the narrative as a kind of psycho-geographical marker. But there are also such visualizations of his origins and desire as the peaches and especially the horse — which plays as important a role in the subconscious of the story’s other protagonist, his grandfather James, as the superhero does in Jimmy’s. And then, of course, there is Jimmy’s red phone(s) carrying the disembodied voice of his overbearing mother, but suddenly — and crucially — also that of his lost father, calling him to meet. In other words, this first part of the book is expository, not just narratively but formally. Things first start coming together in the sequence at the clinic, where Jimmy, who is being treated after his accident in the street, has his first (non-)conversation with his father, James William. Here Ware settles into a storytelling mode that foregrounds the analytical approach to observed reality that he has since made his own. In contrast to earlier sequences, his use of decorative or emphatically symbolic elements is toned down, and—aided by the single, monochrome setting — he maintains a fairly even approach to mise-en-scène and page layout. On one level, the scene is experienced from Jimmy’s point of view. We see him seeing his father, observing his coughs and starts, his gestural tics, as he stumbles through the conversation, interspersed with stream-of-consciousness sequences of the kind that Ware has since refined and continues to use in his present work. This is appropriate for Jimmy, who — we should understand — is in a state of profound doubt and insecurity. The way Ware slows down the panel-to-panel progress of time in this and the following sequences with Jimmy and his father conveys his state of mind. He is unable to relate to the stranger across the room, but simultaneously and consequently experiences the kind of heightened awareness that comes with intense emotional turmoil. The experience further triggers memories and prompts the kind of wild hypothesizing one experiences under stress, something Ware illustrates through color changes, tightening or rearrangement of panel placement, and symbols: bright green monochrome hypothetical flashes before Jimmy’s inner eye, red marks moments of tension, a series of tiny panels suggest the gushing flow of a sudden daydream, a phone ringing intrudes as a red sign into the drab green, indicating Jimmy’s association to his mother. And, as if insisting on this internality, Ware attempts (not quite successfully) at the end of the scene bodily to replicate in the reader Jimmy and his father’s pink afterimage as they emerge from the green rooms of the clinic. More than in any of his previous work, it is in the clinic scene that the locus of Ware’s strengths as an artist — his observational acuity — becomes apparent. His ability to capture character and changes in mood or demeanor by manipulating a minimum of lines of course builds upon a long tradition in cartooning, most significantly for Ware perhaps on Peanuts’ Charles M. Schulz. 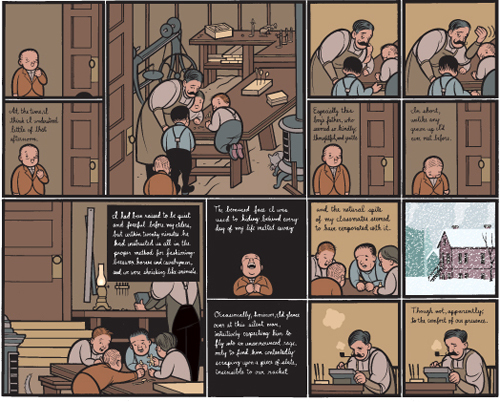 Ware’s contribution lies rather in his uncannily precise cartooning of the details of lived life: smelling the skin of a peach, squinting your eyes in the wind; wrestling with a key in a door; testing with your index finger the temperature of water from a tap; playing with the top of an empty beverage can or with the aperture of your computer disc drive while on the phone; dragging an unplugged appliance cord along the floor after you, and so on. 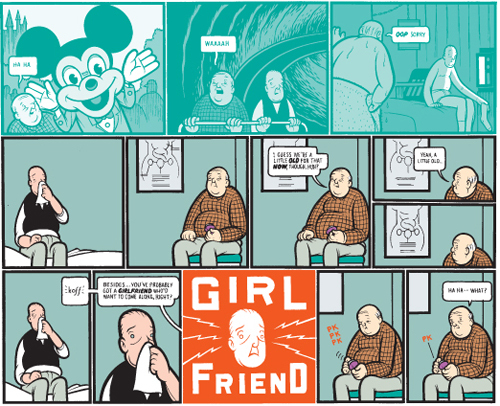 Ware’s characterization happens as much in the writing as in the visuals. Essential to his cartooning is his sense of how people move and speak; each character in Jimmy Corrigan is clearly defined by their physique, gestures and speech patterns. The after dinner conversation, later in the book, between Jimmy and his newly discovered stepsister Amy, is a good example: during the course of eight pages, Ware conveys their tentative rapprochement. Jimmy, for the only time in the entire book, emerges ever so slightly from his state of emotional paralysis, endeavoring gradually to engage the person next to him. He starts paying attention to the photos she shows him, steals glances at her when she looks away, and works extra hard actually to converse. Amy’s demeanor progresses from a sincere effort to situate him in her family context, to an absorption in their father’s and her own history prompted by the photos, to alternating feelings of slight irritation with and kind prodding of her newfound brother. As he has done through most of the book, Jimmy speaks mostly in stuttering monosyllables, while Amy’s personality is further suggested through a combination of firm, slightly motherly charge-taking and matter-of-factness, and girly lapses, the shifting cadence of her voice brought out by the bold emphases on certain words. And when Jimmy finally does start talking, his words come in even, dull droves, sparsely punctuated, unredacted and oblivious. Where Jimmy’s experiences take place in the diegetic now, the concurrent story of his grandfather James’ experiences in the early 1890s with his father, the coldly detached William, is relegated to a living past that mirrors and informs the present. Besides obviously taking place at a different time, Ware distinguishes between these two main diegeses by narrating James’ story. As is his wont, he blurs the distinction between levels of storytelling, sticking for a long time to a present-tense third person perspective that shifts imperceptibly between omniscience and something closer to detached representation of James’ own point of view, written in a precise but occasionally florid language that suggests the repressed poetic sensibility of the ancient grouse that Jimmy encounters later in life. Crucially, James’ narration changes to past tense-first person in the one scene in which he emerges — obliviously, suddenly, and disturbingly cackling with delight — from his shell, upon a visit to his schoolmate’s where he for once plays freely and as an equal. The effect powerfully brings that particular moment to life as the unacknowledged turning point it turned out to be for him. The fact that James then shifts directly to the present tense after the exposition-free, very intense moment of bitter disappointment that follows, only compounds the sense of how memories confound our sense of chronological time. For these are memories. We understand later that the aged James is telling the story to his granddaughter Amy, who interviews him for a school project, although it remains unclear whether she is made privy to everything we are. When the narration once again changes back to the past tense, however, it has nothing to do with Amy, but rather underscores the entire story’s mercurial aspect of recollection. This is a theme central in Ware’s work and one he is currently exploring with unprecedented sophistication in Rusty Brown, but importantly also one that poignantly brings out the symbolic superstructure of his storytelling. As should by now be evident, Ware operates on, and merges, different perspectives. As we have seen, he is concerned with the subjective experience of his characters, but his whole way of cartooning is an attempt simultaneously to analyze and distill this into symbolic form. 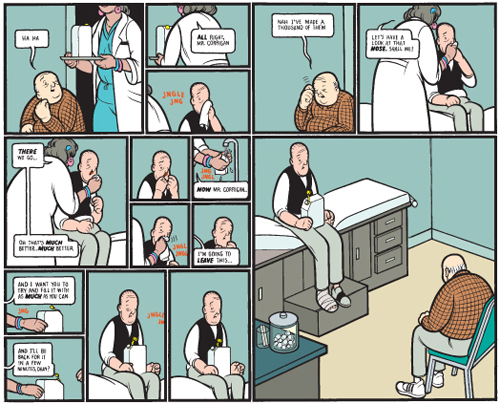 Returning to the clinic scene, the argument that its scrupulously distended paneling represents Jimmy’s heightened state of distraction only goes so far, since Ware applies it consistently throughout the book, as well as in the majority of his other work, for scenes in which there is less of a character-determined motivation to do so. 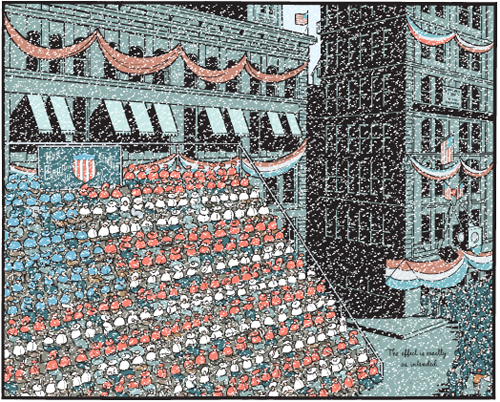 He has often spoken about cartooning as a kind of writing in words and images that one reads rather than sees. Leaving aside the cognitive problems of such a claim, this helps understand his motivation for cartooning the way he does. The ambition is seamlessly to synthesize text and image in order to create a kind of personal handwriting that is both emotionally involved and analytically distant — or dispassionate, as many of his critics prefer it. It is simultaneously internal and external to the experience lived by his characters, and it is in the tension between the two that Ware succeeds or fails as an artist. When extended to an entire book, the glacial pacing, the insistent focus on moments between moments, becomes about something apart from the individual characters. Jimmy and James are never fully realized, trapped as they are in a relentless structure of repetition. This is not helped by the many false notes added to the portrayal of Jimmy in the early chapters of the book. We see intriguing instances of rage and cruelty, and of unsettled eccentricity, that are never followed up and consequently become divorced from the character we get to know as the story progresses. In other words, Ware appears initially to struggle with how best to embody the emotions he wants to express. What are those emotions? Well, it is a matter of public record, and directly explained in the afterword, that he drew upon his own experiences of growing up without a father; how said father contacted him for the first time as he was working on the early chapters; that they met once, awkwardly; and how he died before the book was finished. Add to this Ware’s wife Marnie’s similar experiences with an absentee father entering her life as an adult. Understanding this experience seems to be Ware’s overriding concern in Jimmy Corrigan. In a sense, then, he is not writing realistic characters so much as transposing into a realistic framework the basic principle of some of his great cartoonist predecessors — again most notably Schulz — and creating characters that embody and enable the examination of a very specific set of emotions. Archetypes. Ware himself has stated his preference for Amy, “the only real character in the book”, and it is clear to see why. Although she is given less space than Jimmy, James or even James William, she is very strongly defined, suggesting a more complex character with conflicted but also coherent motivations. In contrast to her brother and grandfather especially, her insecurities resonate, because they are tempered by a willingness to transcend them, to act responsibly and actively to seek answers. She, the adopted child, is the agent who brings together the three generations of Corrigans, an event that leads indirectly both to the tragedy at the end, and the small epiphany that follows it. But symptomatically, she is almost exclusively portrayed from the much less believable Jimmy’s point of view. She hovers around the margins of the narrative as a crucial presence that the reader senses distinctly, but never quite gets to know. As Shaenon Garrity has suggested, this is fairly typical of Ware’s work, even today. There is a narcissistic aspect to it; the archetypical distillation of certain emotions inflicts the story with a crippling myopia that has consequences for its believability as a realistic narrative. 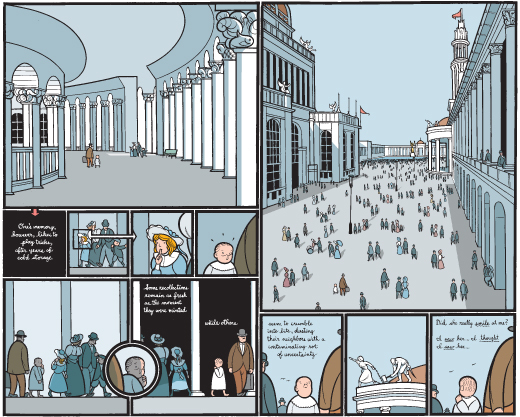 In Jimmy Corrigan, however, Ware does his best to make of this flaw a virtue, extending it into the story’s thematic core. Signs intrude into that scene at the clinic. Some of them are literal ones Jimmy has seen earlier in the story: the U.S. Mail logo, the leaping deer, “#1 Dad”, the bacon spelling “HI”. Some are right there on the premises: the diagram of a woman’s reproductive system, the pinkish-white glow of the drink machine’s Coke swirl. Others are clearly extra-diegetic, imparting information about mental states: the electrical flashes sparking around his disembodied head when his father asks him about his non-existent girlfriend, the hearts he sprouts after the nurse leaves. Others still are harder to get at handle on, most noticeably the bird’s nest outside the window that diverts Jimmy’s attention through the entirety of the scene, which seems simultaneously to illustrate the very real experience of being distracted in a tense situation and something more symbolically loaded. By semiotic reckoning, of course, the whole comic is a set of signs, but Ware seems unusually intent on making this obvious. In this respect, there is a clear line running back to Hergé, whose comics pages exhibit with assumed neutrality an ordered world of signs. Occupied as he is with phenomenological experience, Ware makes less of a claim to ‘objectivity,’ but his analytical distance to his subject carries some of the same implications. At a basic level, he is working in a long-standing tradition for ideogrammatic cartooning, maintaining a very uniform level of representation: departures toward greater naturalism, such as the ones he is currently experimenting with, are almost non-existent, as are passages of lower, rougher definition. What he gives us is a rich, egalitarian graphic field in which text and image operate fairly seamlessly on several levels at the same time. 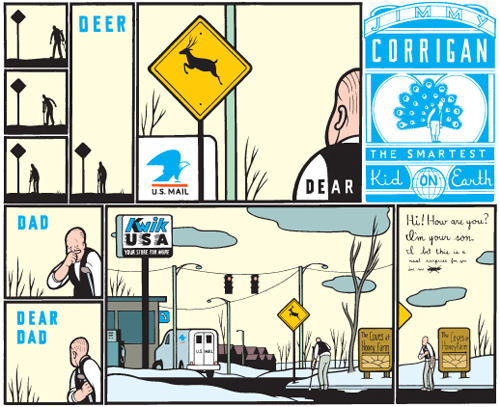 Jimmy sees the U.S. Mail logo and the leaping deer signs while wandering the streets, just before he gets hit by a actual U.S. Mail truck in front of which he steps to approach a real deer. Ware takes this case of literal signposting of the unified reality of his comics page further by embedding in it Jimmy’s only partly conscious reaction to just having met his real father. When they pop up again in the clinic scene, accompanied by the Kwik USA and phone logos that he also saw in the street and several of the other previously mentioned signs, it is as a summation of his relationship with his father: the absent mother in whose womb Jimmy was conceived; the modern communications that brought the two men together and partly enabled — along with four bacon strips — the father’s tentative attempts to communicate with his son; the ironic superficiality of the logo on the t-shirt he lent Jimmy earlier, which also links up to its original giver, Jimmy’s still off-panel stepsister Amy; the nesting birds outside suggesting family and freedom. It is like a combination game, from which emerges meaning pertinent to the story. And while it might partly represent Jimmy’s more or less acknowledged stream-of-consciousness, it is first and foremost there for the reader. Equally important is the connection made between these symbols and Jimmy’s situation. The deer and U.S. Mail bald eagle combine in Jimmy’s mind to “Dear Father”, inserting his predicament in a wider context. The symbols are a summary of the story’s central relationship by a confluence of elements all more or less constituent and emblematic of modern American society, from its repressed wilderness to its technological sophistication. This is the society we witness being built over the four generations encompassed by the story, from William to Jimmy. And to Amy, whom we learn in one of the most beautifully conceived passages of the book, the “family tree” diagram toward the end, is actually related to the Corrigans, not just by adoption but by blood. Amy’s origin thus is another absence to complement the neglect of three generations of Corrigan fathers. The product of a societal amnesia, born of Americans like the little newspaper boy displaced from — but nevertheless red-capped part of — the ‘Living Flag’ that in 1892 celebrated the quadricentenary of Columbus’ landing and signaled the imminent Columbian Exhibition. This macro-narrative of immigration, slavery, and American modernity is laid out in another, sprawling diagram on the inner dust cover of the hardback edition of the book (and, at reduced size, on the early pages of the paperback). When flipped over, it elaborately catalogues and dissects Jimmy’s life, unifying the ‘Smartest Kid’ and ‘Earth.’ Jimmy Corrigan, thus, is the story of an archetypical American family emblematic of an archetypical America that is characterized by absences and neglect. It emphasizes the individual agency of its characters: James’ account of his life to his grandchild Amy; Amy’s prompting of James William to contact Jimmy; Jimmy’s decision to accept his invitation, but it simultaneously engages the social, societal, and economical structures that determine every life — in the American context an industrialized enlightenment project dictated first and foremost by capitalism. A system quintessentially characterized by its absences — of cultural determination, of an ideological core, of an end goal — capitalism is such a fundamental condition of modernity that it cannot help but carry metaphorical weight, and Ware recognizes this, not only in the story he tells, but in the very facture of the work. Jimmy Corrigan celebrates the beauty of modernity while diagnosing its discontents. The stylized, mock-serious intertitles, sometimes executed in industrial imitation of lost calligraphy or with nouveau flourish, are direct reflections of the central ordering principle of the human community at its heart. The even clarity and the boxed-in structure of the pages reflect directly enlightenment principles of selection and categorization, and the very form in which it is executed — comics — is an industrial mass medium born of the offset printing press in the 19th century. 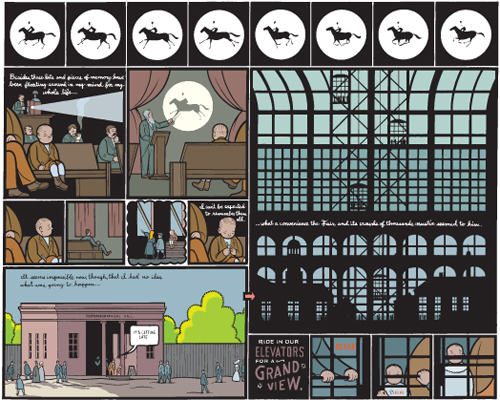 Ware obliquely references the proliferation of comics in America in the 1890s by having William work on the construction of (the unnamed) Eadweard Muybridge’s Zoopraxographical Hall, in which the young James watches his famous Science of Animal Locomotion, particularized on the page as the horse of his desire. Muybridge’s invention of split-second sequential photography not only prefigured film by only a few years, but also shared with comics the era’s obsession with representing the modern world in motion. The ‘World Exhibitions’, of which there were many in the decades around the turn of the century (they still exist, of course, but less influentially), were ambitious attempts to catalogue and contain the entirety of the world (including, here, the immigrant peaches of Jimmy’s imaginary). Colossal monuments to human achievement and physical manifestations of the decentralization of individual and community in the global spectacle of capitalism. A fitting metaphor to have at the center of a story of the 20th century. Most of the book represents architectural space by the analytical means of isometric projection or elevation, with only few practically necessary concessions made to the perspectival illusion of depth of field. Poignantly, however, Ware opens up fully his pages to accommodate mathematical perspective precisely in the World Exhibition sequence. The effect is breathtaking, carrying the moment in the story where he shows his hand — where the personal is situated emphatically in the spectacular. As mentioned at the beginning, Ware has continued building upon the vocabulary he constructed for himself in Jimmy Corrigan and his other early work. In the last few years, he seems to have stepped back somewhat from grand conceptualization, but is continually refining his synthesis of experience and metaphor, especially as it pertains to time and memory (themes that were already central to Jimmy Corrigan, though largely unexamined in this piece). He has expanded his range, concentrating even more on conveying sensual experience through form, color, and by expanding his naturalistic resolution when called for (often in sequences of great emotional import or in the portrayal of significant characters, e.g. Lint’s photo of his sons, or his memory of his first wife). His observational acuity has only gained in assurance: he captures the everyday histrionics of schoolgirls with unexpected aplomb for one of his age, and brings to the portrait of the aging Lint a precognitive sense of arthritic strain. Similarly, his portrayals of inner life have gained tremendously in complexity and scope. ACME #19’s science fiction piece, which turns out to be an unreliably remembered story-within-a-story, subtly reveals how memory and imagination shape our identity and perception of reality, and Lint’s suppressed trauma builds with an inexorable yet mostly discrete encroaching force. 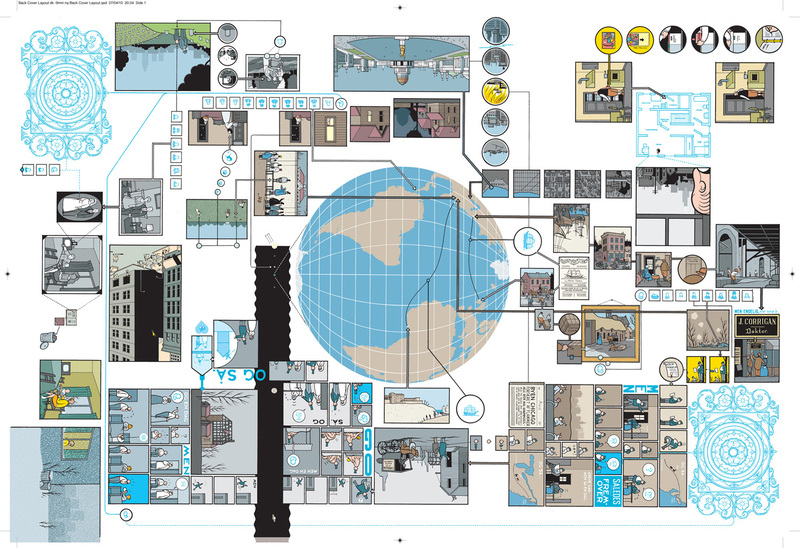 ACME #18, which is the most substantial installment yet of Ware’s other ongoing serial, Building Stories, contains some of his most precise, moving prose in the internal monologue of the main character. And it blends metaphor and experience to great effect in several sequences, not the least the ones where her physical sensation of bodily processes merge with her emotional turmoil as she is unpeeled in the same way as the anatomical illustrations that sparked her adolescent awareness. But the problems of Jimmy Corrigan persist, and in some ways are exacerbated by these developments. Where archetypical character of the Corrigan men ties directly into the book’s conceptual structure, its narcissism a replacement for the absence at its center, Ware is now engaging the much more complex issue of portraying individual life. For all his imaginative reach, ACME #19’s narrator Woody Brown, it turns out, is depressingly like Jimmy, and the trauma that defined his life is more of the same, not to mention uncharacteristically heavy-handed in the telling. And “Lint,” for all its conceptual sophistication and masterly presentation is basically an accumulation of clichés. The portrayal of the main character hits all the wish-fulfillment-fueled preconceptions a nerd might have for his school bully: a half-assed musician driving intoxicated into tragedy, whose Midwestern life and bubble-driven wealth unravels with the recession, as his homophobia catches up with him. It is all a little to easy and seemingly lacks the conceptual logic that enables the archetypical characterization work in Jimmy Corrigan. Rusty Brown is far from finished, however, so we will have to see where Ware takes it. And if we, the long-time readers, have learned anything from him, and not the least from Jimmy Corrigan, it is that he is never complacent as an artist. Just as back then, he is clearly drawing the map as he goes along. Published simultaneously at The Hooded Utilitarian. Other installments in this series: David B.’s L’Ascension du haut mal (Epileptic), Joe Sacco’s Safe Area Goražde, Frank Miller’s The Dark Knight Strikes Again, Sammy Harkham et. al. Kramers Ergot 4, Marjane Satrapi’s Persepolis, Daniel Clowes’ Ice Haven and The Death Ray, Dominique Goblet’s Faire semblant c’est mentir, Chester Brown’s Louis Riel, Gary Panter’s Jimbo in Purgatory.